LOCATION * LOCATION * LOCATION ... THIS HOME HAS GREAT LOCATION ... CANALFRONT HOME w/ NEWER BULKHEAD ... AND INCLUDES BOAT DOCK AND SLIP *** DEEP WATER ACCESS TO ALBEMARLE SOUND ... NO BRIDGES TO GO UNDER ON YOUR WAY OUT TO THE SOUND *** HOME FEATURES 3 LEVELS ... WITH TOP LEVEL 3 FEATURING SPACIOUS OPEN GREAT ROOM w/ HIGH CEILINGS, RECESSED LIGHTING AND CEILING FANS IN KITCHEN, DINING AND LIVING AREAS ... WITH SLIDING GLASS DOOR OUT TO UPPER SUN DECK W/ FABULOUS VIEWS DOWN THE CANAL ... BOTH WAYS! * LEVEL 3 ALSO INCLUDES A FULL BATH AND MAIN BEDROOM *** LEVEL 2 FEATURES THREE BEDROOMS AND TWO ADDITIONAL BATHS, AND WASHER/DRYER CLOSET IN HALLWAY *** INTERIOR STAIRWELL TO LEVEL 1 GROUND LEVEL FEATURES 12 X 25 GARAGE AND SEPARATE 14 X 30 AREA WHICH INCLUDES NICE ENTRY FOYER AND ADDITIONAL ROOM WHICH COULD BE A FAMILY REC ROOM OR GAME ROOM * THE PHOTOS TELL THE STORY ... NEWER HVAC, FLOORING, INTERIOR PAINT AND BULKHEAD *** YARD IS LANDSCAPED ... WALKWAY TO ENCLOSED OUTSIDE SHOWER AND BOAT DOCK/SLIP *** LIVE HERE AND BE ON THE WATER IN YOUR BOAT IN MINUTES! *** COMMUNITY FEATURES LARGE CLUBHOUSE, PARKING AREA, BOAT RAMP, BOAT SLIPS, POOL, PLAY PARK ON THE SOUNDFRONT (POOL/BOAT SLIPS ADDITIONAL EXPENSE) - AND COMMUNITY TENNIS COURT NEARBY - GREAT FUN FOR THE ENTIRE FAMILY *** COME SEE THE WEDNESDAY SUNSET SAILING REGATTAS ... TOO MUCH FUN! *** COLINGTON HARBOR IS A GATED COMMUNITY AND IS CLOSE TO THE WRIGHT BROTHERS MEMORIAL ON THE WAY OUT TO THE BEACH ... THE BEACH ACCESS IS A STRAIGHT SHOT AT END OF OCEAN BAY BOULEVARD AT THE KILL DEVIL HILLS LIFE GUARD STATION *** CLOSE TO SHOPPING, RESTAURANTS, PUBLIX, LOWES AND SO MUCH MORE! *** HOME COULD GENERATE IN THE RANGE OF $1500 PER MONTH ON A YEAR ROUND LEASE FOR A YEARLY GROSS INCOME AT $18,000 * OR THE HOME COULD BE A SEASONAL WEEKLY VACATION RENTAL HOME * BUT ALSO A GREAT SECOND HOME OR PRIMARY RESIDENCE - ALL OPTIONS HERE! *** TURN KEY MOVE IN CONDITION ... 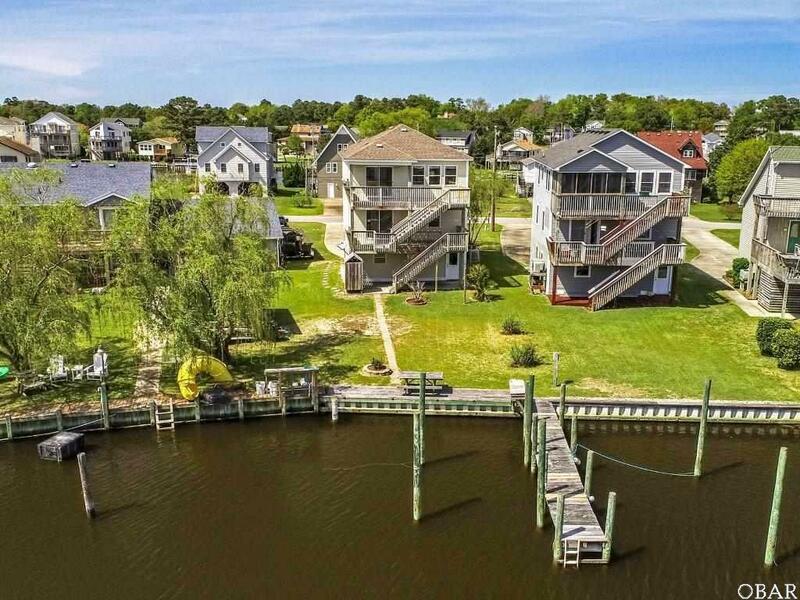 THIS 4 BEDROOM HOME IS A GREAT VALUE ON THE WATER * HOME IS READY FOR SUMMER FUN AROUND THE CORNER AND ENJOYMENT ALL YEAR LONG ... CHECK OUT THE AERIAL PHOTOGRAPHY ... COME SEE!